The GD4500 2D scanners are the newest members of the Datalogic Gryphon Series. What is new? 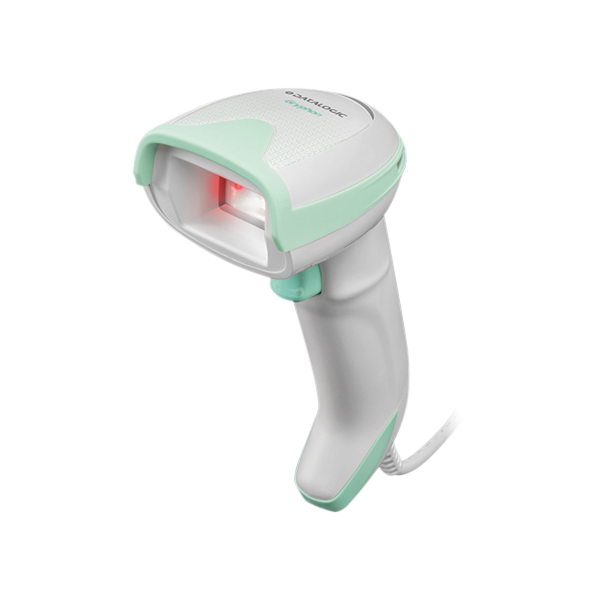 A high-resolution megapixel sensor that quickly captures barcodes – even damaged or poorly printed ones – and white lighting which is particularly easy on the eyes. Additionally, the housing shape has been revised, and the result optimally combines ergonomics with elegance. With high performance and an attractive design, the Gryphon 4500 Series is suitable for a wide variety of usage areas, such as at the POS, in production, in logistics or for access control. There is also a special version available for healthcare: the Gryphon GD4500-HC. 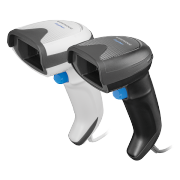 The scanners of the Gryphon GD4500 Series not only use soft warm white light for capturing barcodes, but also support users during aiming with four targeting dots and a crosshair. This also allows single barcodes mixed in among many to be quickly and precisely captured. Thanks to modern Motionix movement sensors, the scanners recognize whether they are needed in handheld or presentation mode, and they automatically switch between the two. When it comes to interfaces you have two options: USB port or multi-interface with USB, RS232 and keyboard wedge. Do you still have questions regarding the new Gryphon GD4500 Series, or would you rather pre-order now? Your sales representative will gladly assist you either way! Just give us a call!